In Geography, we study about the earth as a whole. Political Geography is a branch of geography which studies the political entities like countries, across the globe. It always helps to have a good idea about the location of different nations. List of countries of the world, classified according to the continent they belong is given below. 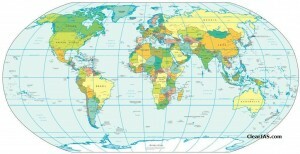 A world map is also given for reference purpose. As of now there are 193 UN member nations and more than 6 Non-UN members. Africa is the continent with most number of nations (54). * Those countries of the world marked with * symbol are classified along with Europe and not with Asia in some listings. Apart from these nations, there are numerous islands and territorial regions claimed by different nations as their foreign territories. 1. Bermuda is not a sovereign state but a British overseas territory; while Antigua and Barbuda is a sovereign state.